http://thesurvivalpodcast.com takes you survival fishing with a minimalist kit. In this first video Jack demonstrates how to quickly create a make shift fishing pole, insure you don't loose a fish if the rod breaks and how to turn a flower into a fishing lure. If you have a tarp and three poles and the situation allows, make a survival tarp tepee. It is easy and takes very little time to make this survival tepee. It provides protection from the elements and can act as a signaling device by enhancing a small amount of light from a fire or candle. It is large enough to hold several people and their equipment and to allow sleeping, cooking, and storing firewood. You can make this tepee, you need three poles 3.5 to 4.5 meters long and about 5 centimeters in diameter. Lay the poles on the ground and lash them together at one end. Stand the framework up and spread the poles to form a tripod. For more support, place additional poles against the tripod. Five or six additional poles work best, but do not lash them to the tripod. Determine the wind direction and locate the entrance 90 degrees or more from the mean wind direction. Place the tarp over the top of a free-standing pole. Then place the pole back up against the tripod so that the tarp is at the same height as the lashing on the three poles. Wrap the tarp around one side of the tripod. 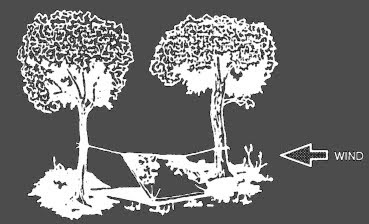 The canopy should be of double thickness, as you are wrapping an entire tarp. You need only wrap half of the tripod, as the remainder of the tarp will encircle the tripod in the opposite direction. Construct the entrance by wrapping the folded edges of the tarp around two free-standing poles. You can then place the poles side by side to close the tepee's entrance. Place all extra tarp underneath the tepee poles and inside to create a floor for the shelter. 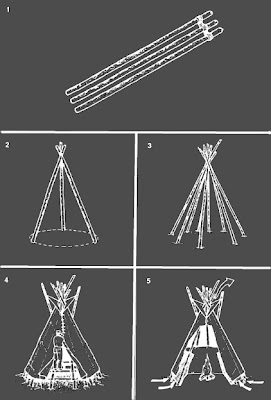 Leave a 30- to 50-centimeter opening at the top for ventilation if you intend to have a fire inside the tepee. 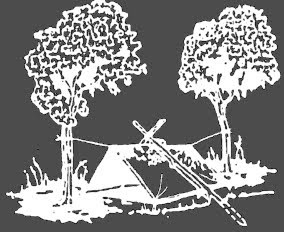 Another center support survival shelter is a Ponch Tent A-Frame set outside but over the center of the tent (Below). Use two 90- to 120-centimeter-long sticks, one with a forked end, to form the A-frame. Tie the hood's drawstring to the A-frame to support the center of the tent. The food you have stored in your house. The food in your office. The food in other offices in your building/neighborhood/city (bring a crowbar). The food running around near your home (squirrel, possum, rabbits, etc). The wild food you can gather (berries, cat tails, apples, nuts, etc). The larger food in the forest (deer, elk, bear, etc). Larger food on local ranches (pig, goat, cow, etc). Food in water near your home (fish, shellfish, seaweed, etc). Food on local farms (vegetables, grains, fruit, etc). Food in warehouses/cold storage warehouses. Food in institutions (ie: food banks, schools, hospitals, etc). Food in vacation homes and homes where people have left. Food in your yard (dandelions, vegetables and fruit you have grown, etc.). Food on the way to its destination (shipping containers, refrigerated trucks, etc). Food you can create (quick growing vegies and meat supplies). Food provided by relief organizations. Food that any other day you wouldn't consider food (rats, bugs, pigeon, etc). Food you can have brought in (ie: a contact from an area not hit that could bring you supplies). Food that others may overlook (honey from bees, maple syrup from trees, snakes, etc). Food that takes concerted effort/materials/equipment to get (ie: whale, other deep sea fish, mountain goat, etc). Food that freegans would love (search dumpsters, garbage cans, garbage dumps, etc). Food that isn't people food (dog food, cat food, animal food stored in grain silos, etc). Obviously most of these sources have drawbacks. Some sources may mean you need to break the law to get at it, some sources have a decided ick factor, and some sources mean you my end up fighting over it with others who are equally hungry. Also, once you acquire food from the aforementioned sources, you will need to hide it/guard it/protect it. Water can be disinfectes and in this way made drinkable using the rays of the sun. "Solar water disinfection" - SODIS for short - thus offers a solution for preventing diarrhoea, one of the most common causes of death among people in developing countries. The SODIS method is ideal for treating water for drinking in developing countries. All it requires is sunlight and PET bottles. How does it work? Clear PET bottles are filled with the water and set out in the sun for 6 hours. The UV-A rays in sunlight kill germs such as viruses, bacteria and parasites (giardia and cryptosporidia). The method also works when air and water temperatures are low. People can use the SODIS method to treat their drinking water themselves. The method is very simple and its application is safe. It is particularly suitable for treating relatively small quantities of drinking water. Many scientific studies confirmed the effectiveness of the SODIS method. It kills germs in water very efficiently. The method has even been shown to improve the health of the population. Research into training strategies gave insight about which communication methods are most suitable. It has also been proven that the use of PET bottles in the SODIS method is harmless. This is a pretty neat trick. You trim back the plastic sleeve on the negative end of the battery on one side - not all the way around. 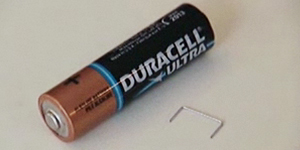 You pry up the end of the battery slightly, and put one end of the bent staple (or paper clip, or wire, or whatever) in the gap, under the paper insulator. Then you use a piece of char cloth or high quality tinder to press the free end of the staple against the negative contact of the battery. If your tinder is good, it will produce enough heat to get a coal. Here is a link to the video: (I did not make this video, I found it) http://www.wonderhowto.com/how-to-su...staple-222300/ If you are in the woods you may likely have a camera or other device that requires batteries. I imagine that this could be done with AAA, C, or D batteries as well. If you do not have a staple, you are like to be able to come up with a usuable piece "wire-like" metal. The only drawback I can see, and it is a big one, is the necessity of having char cloth or extremely good tinder on hand. Tie off the poncho hood in the same way as the poncho lean-to. Tie a 1.5- to 2.5-meter rope to the center grommet on each side of the poncho. Tie the other ends of these ropes at about knee height to two trees 2 to 3 meters apart and stretch the poncho tight. Draw one side of the poncho tight and secure it to the ground pushing sharpened sticks through the grommets. Follow the same procedure on the other side. If you need a center support, use the same methods as for the poncho lean-to. It takes only a short time and minimal equipment to build this lean-to (Below). You need a poncho, 2 to 3 meters of rope or parachute suspension line, three stakes about 30 centimeters long, and two trees or two poles 2 to 3 meters apart. Before selecting the trees you will use or the location of your poles, check the wind direction. Ensure that the back of your lean-to will be into the wind. Tie off the hood of the poncho. Pull the drawstring tight, roll the hood longways, fold it into thirds, and tie it off with the drawstring. Cut the rope in half. On one long side of the poncho, tie half of the rope to the corner grommet. Tie the other half to the other corner grommet. Attach a drip stick (about a 10-centimeter stick) to each rope about 2.5 centimeters from the grommet. These drip sticks will keep rainwater from running down the ropes into the lean-to. Tying strings (about 10 centimeters long) to each grommet along the poncho's top edge will allow the water to run to and down the line without dripping into the shelter. Tie the ropes about waist high on the trees (uprights). Use a round turn and two half hitches with a quick-release knot. Spread the poncho and anchor it to the ground, putting sharpened sticks through the grommets and into the ground. If you plan to use the lean-to for more than one night, or you expect rain, make a center support for the lean-to. Make this support with a line. Attach one end of the line to the poncho hood and the other end to an overhanging branch. Make sure there is no slack in the line. Another method is to place a stick upright under the center of the lean-to. This method, however, will restrict your space and movements in the shelter. For additional protection from wind and rain, place some brush, your rucksack, or other equipment at the sides of the lean-to. To reduce heat loss to the ground, place some type of insulating material, such as leaves or pine needles, inside your lean-to. Note:When at rest, you lose as much as 80 percent of your body heat to the ground. 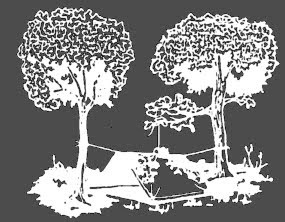 To increase your security from enemy observation, lower the lean-to's silhouette by making two changes. First, secure the support lines to the trees at knee height (not at waist height) using two knee-high sticks in the two center grommets (sides of lean-to). Second, angle the poncho to the ground, securing it with sharpened sticks as above. A shelter can protect you from the sun, insects, wind, rain, snow, hot or cold temperatures, and enemy observation. It can give you a feeling of well-being. It can help you maintain your will to survive. In some areas, your need for shelter may take precedence over your need for food and possibly even your need for water. For example, prolonged exposure to cold can cause excessive fatigue and weakness (exhaustion). An exhausted person may develop a "passive" outlook, thereby losing the will to survive. The most common error in making a shelter is to make it too large. A shelter must be large enough to protect you. It must also be small enough to contain your body heat, especially in cold climates. It must contain material to make the type of shelter you need. It must be large enough and level enough for you to lie down comfortably. When you consider these requisites, however, you cannot ignore your tactical situation or your safety. Provides concealment from enemy observation. Is suitable for signaling, if necessary. Provides protection against wild animals and rocks and dead trees that might fall. Is free from insects, reptiles, and poisonous plants. Avoid flash flood areas in foothills. Avoid avalanche or rockslide areas in mountainous terrain. Avoid sites near bodies of water that are below the high water mark. In some areas, the season of the year has a strong bearing on the site you select. Ideal sites for a shelter differ in winter and summer. During cold winter months you will want a site that will protect you from the cold and wind, but will have a source of fuel and water. During summer months in the same area you will want a source of water, but you will want the site to be almost insect free. When considering shelter site selection, use the word BLISS as a guide. B- Blend in with the surroundings. How much time and effort you need to build the shelter. If the shelter will adequately protect you from the elements (sun, wind, rain,snow). If you have the tools to build it. If not, can you make improvised tools? If you have the type and amount of materials needed to build it. To answer these questions, you need to know how to make various types of shelters and what materials you need to make them. CAMP HYGIENE Keeping healthy is an important factor for survival, so strict hygiene should be practiced, not only personally but in the planning and running of a camp. Rubbish and latrines MUST BE kept away from the camp to reduce the threat from flies. Since most of the common diseases in a survival situation are water-born, pollution of drinking water MUST BE RIGOROUSLY AVOIDED. Food scraps and other rubbish should be burned in the fire if possible. CAMP LAYOUT Select sites for all camp activities so that they do not interfere with each other or pollute the living and cooking areas. If you are camped by a river or stream, fix specific sections for activities and keep to them. Latrines should be dug downhill of the camp and away from the water supply so that there is NOpossible risk of seepage polluting either. ACTIVITY AREAS Establish a water point from which drinking water will be collected and ensure that nobody wash, cleans pots, scrubs clothes or otherwise uses the water upstream of this point. Downstream, choose a wash point for personal bathing and clothes washing and farther downstream of that select a place to be used for cleaning cooking utensils. LATRINES AND URINALS Latrines and rubbish disposal should be well away from the camp and preferably downwind. But not so far away that is inconvenient and people are tempted to go elsewhere. If necessary cut a track to it to make access easier. It is important that proper latrines be established, even for the lone survivor. With a group, separate latrines for the sexes may make a mixed group feel more comfortable, and as much privacy as possible should be provided. Even if you have it, DO NOT use disinfectant in a latrine. Lime or disinfectant would kill the USEFUL bacteria that break down waste, it will then start smelling! After using, cover the waste with earth. Add small amounts of water that will promote the bacteria. Make a latrine cover to keep out flies and REMEMBER ALWAYSto replace it, or flies may walk all over your food and start a cycle of infection. If, after a time, a latrine starts to smell, dig a new one. Fill in the old latrine. Build a new seat and burn old timbers and covers. DEEP TRENCH LATRINE Dig a trench about 1.25m (4ft) deep and 45cm (18in) wide. Build up the sides with logs or rocks and earth to make a comfortable sitting height, sealing the gaps between them. Lay logs across to leave only a hole. Empty wood ash on the logs to make a seal. It will also deter flies. Make a lid of smaller wood to cover the opening or use a large flat rock or a large leaf weighted down with stones. ALWAYS REMEMBERto replace it. URINAL Dig a pit about 60cm (2ft) deep. Site it close enough to the camp to ensure that people bother to use it. RUBBISH DISPOSAL Rubbish, after checking that it really has no USEFULvalue, should be burned, and what cannot be burned should be buried. If there is too much waste for the camp fire to burn, make a separate fire in the latrine area. If a large can is available use it as an incinerator. Bury any unburned refuse in a garbage pit. CAMP DISCIPLINE Do not prepare wild game in camp. Bleed, gut and skin downwind and downstream from camp. Keep food covered and off the ground. If kept in trees MAKE SUREit is secure from tree-dwelling animals. Replace lids on water bottles and containers IMMEDIATELYafter using them. Stow spare clothing and equipment in your shelter. Do not leave it lying where it can get wet, soiled, or burned. Have a place for everything and keep things tidy. Use a tree for hanging mess tins and cooking utensils. Hook them on twigs and branches, a place for mugs and spoons and keep everything off the ground. Note:Never leave your campfire unattended. SOAP Washing with soap removes natural oils, leaving the skin less waterproof and more prone to attack by germs. In survival circumstances it is a mistake to wash with soap too often. However, soap is the most widely used antiseptic, better than many others, such as iodine, which destroy body tissue as well as germs. Always scrub hands before administering first-aid for wounds. NEVER SIT ON DAMP GROUND Use something, even if it is only a log. If there is no ready-made seat available, lash together a couple of low A-frame supports and rest another branch or log across them. CAMP BEDS A sound night's rest is worth a little toil. Time spent in making a camp bed that will keep you both comfy and warm, is time well spent. First and foremost the right equipment. When you are cooking over a fire, there are a few things to remember. When you are able to think about these things as a system for cooking, you will automatically know what sort of pans and equipment will work on the fire. If you sit a pan directly on the hot coals, your food will likely burn. If you hang your pan too far above the coals, it will not cook. If you try to cook over a fire instead of a bed of coals, you will be frustrated. So what you need to work toward is a bed of hot coals, and a pan that is not too close nor too far away from the coals. Obviously you will have to replenish your hot coals from time to time as you are cooking. So in your fireplace, choose a spot that is comfortable for you to reach to cook in, and another place to the side or rear of the fireplace to keep a fire going. I cook all along the front and one side of a fireplace, and allow the fire to burn in the left rear portion of the box. Whenever the coals burn out or loose some of their heat, scoop hot coals from the fire area to the cooking area. Some of the spent coals can be removed during cooking, but I usually wait 'until the cooking is over to do that. Spiders These are three or four legged trivet-like things that hold your pans above the coals. They have a ring for the pan to sit in and an open bottom. They can be purchased in varying heights so that you can cook close to the coals or several inches away from them. Three different heights would be ideal, but two would do. The really tall ones are great for keeping food warm. If you equip your fireplace with a trammel or hanging arm, you can buy all kinds of do-dads to hang on it and hang your pots from. I like the one that adjusts from short to long so you can adjust how quickly your food is cooking without moving the pot off the fire. This is especially handy if your fireplace is small and you are cramped for room in there. Utensils - Well, obviously you want long ones....but don't get them any longer than what is comfortable for you to manage. My very longest ones are 18". Also consider getting cast iron utensils instead of stainless or wooden ones. They just last longer. You need a spoon, a slotted spoon, a fork or three of various sizes, two spatulas, one short and one long, and that's all that is really essential. As you cook more and more you will find that there are other utensils that you would like to have. Choose very sturdy ones, for you will find that you use them for lifting Dutch Oven lids, pots and pans and other heavy items out of the fire. I finally got a utensil that is nothing more than a big hook to do just that! You might want a spit to roast meat on, but I bind the meat up with cotton thread, season it and hang over slow coals for about 6-8 hours to roast. Works well, if you can stand the aroma for that long! Another good way to roast meat like venison steaks, is to skewer the meat onto a large fork and prop the fork up in front of the fire, turning frequently 'until the meat is done. There are reflector ovens made for the fireplace and they are really great.....once you learn how to use them properly, and that takes practice. They can be used to cook meats, breads, cakes, cookies, or casseroles. They are relatively slow cooking, but they do the job very well, as soon as you learn how to keep the coals at an even temperature and how to pull the oven back from the fire when it becomes too hot. There are also Dutch Ovens. I recommend one with a lid that has a lip on it so that you can put hot coals on top of it without them sliding off. The coals on the top of the lid helps the food to cook from both the top and bottom of the pan, much the way a conventional oven does. This is the best way to bake in the fireplace, besides the reflector oven. You want Dutch Ovens that have LEGS. You will need at a minimum of three Dutch Ovens to cook a large meal. They can be used to cook cakes, cornbread, puddings, soups, stews, roasts, on and on.....The trick is to keep the pan moving every ____ minutes. You will fill in the blank as you are more experienced, but I find that I like to move my Dutch Oven around and reposition it with new coals every 5-15 minutes. It's very easy to burn a cake in a Dutch Oven...How do I know? Oh....never mind. Pots and Pans - Well, just get cast iron and make sure that they all have LEGS on them! You want the coals to be able to get up under the pans to cook the food, this way you don't have to sit the pan ON the coals and risk burning. Make sure they have handles, too. You will need a safe place to sit hot pans coming off the fire, lots of dish towels and all of the usual fireplace accouterments like a shovel, ash bucket, bucket of water for emergencies, poker. You will need a large pan or tray to place your utensils on while you are using them. One last thing I have learned about cooking over a fire. When I am pushed for time and I have hungry people to cook for I have to use higher heat and therefore more grease in my cooking. However, if you are not pressed for time and you can relax a bit, you can cook with lower temperature coals and use less grease. This may not seem important now, but as you cook on the fire more and more you will catch yourself adding more grease to whatever you are cooking because the temp. is too high. You are going to have to grease the pans a lot more than you are probably used to doing anyway with conventional cooking, especially considering our low fat ways these days. But as you become more experienced, you can cut back on the grease considerably. Oh, and most importantly, take your time when you can, don't stress out when you're over the fire, and don't cook with little ones all around you. Dissolve 4 tablespoons of salt in 1 liter of water and drink. Do not repeat this treatment. Eat 1 to 1.5 cigarettes. The nicotine in the cigarette will kill or stun the worms long enough for your system to pass them. If the infestation is severe, repeat the treatment in 24 to 48 hours, but no sooner. Drink 2 tablespoons of kerosene but no more. If necessary, you can repeat this treatment in 24 to 48 hours. Be careful not to inhale the fumes. They may cause lung irritation. Peppers are effective only if they are a steady part of your diet. You can eat them raw or put them in soups or rice and meat dishes. They create an environment that is prohibitive to parasitic attachment. Limit your intake of fluids for 24 hours. Drink one cup of a strong tea solution every 2 hours until the diarrhea slows or stops. The tannic acid in the tea helps to control the diarrhea. Boil the inner bark of a hardwood tree for 2 hours or more to release the tannic acid. Make a solution of one handful of ground chalk, charcoal, or dried bones and treated water. If you have some apple pomace or the rinds of citrus fruit, add an equal portion to the mixture to make it more effective. Take 2 tablespoons of the solution every 2 hours until the diarrhea slows or stops. Defined as the body's failure to maintain a temperature of 36 degrees C (97 degrees F). Exposure to cool or cold temperature over a short or long time can cause hypothermia. Dehydration and lack of food and rest predispose the survivor to hypothermia. Unlike heatstroke, you must gradually warm the hypothermia victim. Get the victim into dry clothing. Replace lost fluids, and warm him. First, stop the burning process. Put out the fire by removing clothing, dousing with water or sand, or by rolling on the ground. Cool the burning skin with ice or water. For burns caused by white phosphorous, pick out the white phosphorous with tweezers; do not douse with water. Soak dressings or clean rags for 10 minutes in a boiling tannic acid solution (obtained from tea, inner bark of hardwood trees, or acorns boiled in water). Cool the dressings or clean rags and apply over burns. Treat as an open wound. Consider using morphine, unless the burns are near the face. This condition results from many hours or days of exposure to wet or damp conditions at a temperature just above freezing. The nerves and muscles sustain the main damage, but gangrene can occur. In extreme cases the flesh dies and it may become necessary to have the foot or leg amputated. The best prevention is to keep your feet dry. Carry extra socks with you in a waterproof packet. Dry wet socks against your body. Wash your feet daily and put on dry socks. This injury results from frozen tissues. Light frostbite involves only the skin that takes on a dull, whitish pallor. Deep frostbite extends to a depth below the skin. The tissues become solid and immovable. Your feet, hands, and exposed facial areas are particularly vulnerable to frostbite. When with others, prevent frostbite by using the buddy system. Check your buddy's face often and make sure that he checks yours. If you are alone, periodically cover your nose and lower part of your face with your mittens. Do not try to thaw the affected areas by placing them close to an open flame. Gently rub them in lukewarm water. Dry the part and place it next to your skin to warm it at body temperature. Youth instructor Ryan Douglas covers basic winter shelter concepts while building a quinzee snow shelter. NOTE: I would not dismiss Ryan because he is young, it is very evident he knows exactly what he is talking about. He gives many related tips in surviving in a winter climate that could very well save your life! how to make a figure four dead-fall trap...This is a great survival trap that can be easily constructed ( with practice ) out of very basic materials that in most environments can be easily found...The trap can also be made with very limited, or primitive tools. In the event you get lost in the wilderness with no immediate rescue, this trap can provide a temporary food source by catching squirrel, catching chipmunk, catching mice, catching rats, catching small rodents, catching birds, and catching small animals, it is also a good trap for pest control. I made the trap with only a small multi-tool, a rock, and a small sapling...For bait I used a small amount of peanut butter... Chocolate, cheese, and even tooth paste can be used...I guess you can use what ever you can find when lost in the woods. I set the trap behind a friends house because he was having problems with a pest red squirrel that was causing damage to his property...I recommend never setting any trap without knowing the laws. While this site is not dedicated to wilderness survival, leaning more toward natural or man made disaster, I think it is important to take the time to at least become acquainted with the basics of outdoor survival skills. A majority of outdoor survival training could prove invaluable after tshtf. The cattail is one of those plants that grow wild just about everywhere in the United States, and is often regarded as a weed by most people passing by. But it is indeed a very useful plant for the survivor, as an extra food source or to save money on your grocery bill. Cattails can be found year-round in swamps and marsh areas, and along banks of streams, ponds, rivers, irrigation ditches and other wet environments, making the cattail an excellent source of survival food, or a supplement to the table. Caution: If you are uncertain about the purity of the water in which you are collecting cattails you should not eat the cattails raw. A huge amount of water from the source is taken up by the plants and if polluted could make you sick. Add eggs, honey, oil and milk and mix thoroughly. If the batter seems to thick to pour, add more milk until it has a good pancake batter consistency. Cook on a hot griddle until golden brown. What is your favorite wild food and how do you use it, let us know in the comments. When you become stranded or lost in the middle of the woods it is an encouraging thought that simply by looking around you can easily discover a vast multitude of foods. As a survivalist it is our responsibility to ourselves and to our families to be able to recognize and find these value food sources should we need them. Granted most survival situations are not serious and are of short duration however it only takes one time to not have the proper knowledge. During these short duration emergencies the immediate demand remains shelter and potable water realizing that you have the knowledge to obtain food in the wild acts as a great comfort when lost even for a short period of time so be certain that you are up on these skills. When in the wilderness you will encounter several basic different types of survival foods. Determining which type to use will depend upon where you are at as well as what equipment you have to work with. Wild Berries represents the first group of foods you may encounter. This is also the simplest and easiest of the foods to obtain. Given the proper season you may possibly encounter several different berry selections to choose from. A simple rule of thumb to follow is if the berry looks or it tastes like a strawberry, blueberry or a raspberry then it must be one. For safety reasons most of the other berries that you may encounter you should be able to identify by looking at it. These berries would include June berries, wild currants, bearberries, bunchberries, wintergreen berries, wild cherries, blackberries, thimbleberries, rose hips and cranberries. The second group of survival foods is those which originate from the water such as fish. It is safe to eat all of the freshwater fish found in North American waters. It is possible with little practice to catch a fish with your bare hands although in most cases this will not happen. Wait patiently as they swim by you and very quickly pin the fish to the bottom of the water with your hands. You may also chase the fish into a shallow pool of water and trap them there. If you happen to have an emergency fishing kit with you it is possible to use worms or grasshoppers to catch your fish. Fish can be very evasive so in many cases it is easier to try and catch other survival foods within the stream or the lakes such as clams or mollusks which can easily be picked up. These are also easily prepared by cooking over an open fire. Crayfish can often be found crawling upon the bottom of the streams and the lakes or hiding under logs or rocks in the water. Keep in mind that the only usable parts of these craw fish are the tails. Next we have the Insects And miscellaneous Bugs as a survival food. Be reminded that not all insects are can safely be eaten. If you do not know for sure which ones they are stay with wood grubs and grasshoppers. Grasshoppers can easily be caught by hand in any grassy field while the grubs can be found by opening up a rotting log. The survivalist on TV may eat them raw however you should cook and remove all legs and wings before eating them. Birds represent another source of survival food in the woods. It is not likely that you will be able to kill or capture most bird unless you have a gun. The birds that nest upon the ground may possibly be obtained with the use of a well aimed rock while they are nesting. The eggs from the ground nesting birds can be a good survival food. Once again although larger animals will be prevalent it isn’t likely that you are going to bag one without the proper weapon. It is extremely difficult to kill any of the mammals without some sort of gun. Don’t for one moment think that you could use a spear or other primitive weapon to obtain an animal for dinner. It only happens in Rambo films. I personally would not even recommend that you waste your time and energy trying. A solar still uses the power of the sun to purify water. The sun's heat evaporates water, and the vapor leaves contamination behind. Once the water vapor hits the top of the solar still, it condensates and slides down the lid into a collection basin. A solar still is one way to purify water. A still is easy to make and good for use in a wilderness survival emergency. Step 1 Select a damp place open to the sunlight. A damp location generates more purified water, so find a spot that water runs into. Dry stream beds, bottoms of hills and places near water sources make good locations. Step 2 Dig a 3-foot-deep hole. You want to dig into moist soil, because the moisture from the ground will become the potable water. Add vegetation, contaminated water or urine to the hole to add moisture. Remember, a solar still purifies any water; so even urine will be drinkable. Step 3 Place your water bottle into the center of the hole. To support the bottle upright, you can push dirt around its base. Step 4 Cover the hole with a sheet of plastic. Seal the edges of the plastic sheet with dirt and rocks. Make sure the plastic is taut and the seal airtight. Place a rock in the center of the plastic and over the bottle. The sheeting should bend to a point over the bottle. When the moisture evaporates, it condensates against the plastic. The condensation slides toward the rock and drips into the bottle. Step 5 Wait two hours, a solar still will purify one quart of water in two hours. Drink your purified water and reset the still to make more. Dandelion greens, which are present in the early spring, can reduce swelling and support digestion. Eat them in a salad or boil them and drain away the water to remove some of the bitterness. Dandelion buds have a buttery flavor. Avoid picking dandelions in areas that are frequented by pets or where runoff or chemical sprays may have coated the plants. Dandelion is high in vitamins A, C and D, B complex vitamins, potassium, calcium, iron and zinc. The flowers have antioxidant properties, the leaves antiviral effects and the root may improve digestion. The University of Maryland Medical Center suggests you avoid using antacids if you are eating dandelions. Rose hips are the fruit of the rose plant and one of the richest plant sources of vitamin C. They also contain vitamins D and E, soluble fiber, essential fatty acids and antioxidants. Vitamin C can act as an antihistamine. Ingesting rose hips may help with cold symptoms. In dried form, they are lightweight and easy to pack. Collect and boil rose hips to make tea. Boil them longer (10 minutes is recommended for dried rose hips; 2 tbsp. to 1 pt. water) to enhance their flavor and potentially add more nutrients to the water. The hips themselves can be eaten boiled and mashed. Cattails can be eaten as food, with the edible portions changing as the seasons pass. Cattail stalks should be harvested while they are immature; otherwise, when you break them open you will find a wood-like reed (and maybe a few worms). The rhizomes are edible boiled or dried, but the rhizome is labor-intensive to harvest and prepare. Grasp the outer leaves and bend them downward to expose the main shoot. The shoot can be cut, twisted or pulled to remove the center of the plant. Be prepared for the slimy residue. Washed and sliced, cattail shoots have a flavor like mild cucumber. They make a filling snack, vegetable side or salad ingredient. Steam and eat the male flower head or collect the cattail pollen to make bread. You will have to mix the pollen with flour, because unless you time your collection perfectly, the amount you collect per plant will be small. To collect pollen, place a bag gently around the flower head, bend the stalk and shake it. Try eating cattail if you have an upset stomach. Cattail also is a mild diuretic and a tonic. The gel emitted when the stalks are harvested soothes irritated skin. There is no need for the novice prepper or "prepper family" to create the equivalent of a corporate disaster response plan; there will be time for that later on. While it is important for you to know the types of disasters that are most likely to affect you based on where and how you choose to live your daily life, prepping can quickly become a daunting task if you focus too much on the minute details rather than the totality of staving of adversity as you begin to prepare yourself and your family. Once the basics are covered, it is then expected that you will round out and expand on your basic preparedness to address the more advanced and in some cases long term needs that you will have to overcome. Let's start with the obvious - In some scenarios, your survival of the initial disaster is not assured. Earthquakes, tornadoes, floods, tsunamis and asteroid impacts to name but a few, will kill lots of people outright. There is no amount of preparation that will save you from the effects of a nuclear blast or a terrorist bomb that detonates next to your desk at work. Preparing is what you do to mitigate the after effects of a disaster so that you can maintain your health and well being until you can recover and move beyond the adversity and disruption to your daily life. To accomplish this goal in a relatively straight forward manner, it is important that the bulk of your advance preparations focus on the generalities of survival, regardless of the circumstances that brought about the need to survive. You would come to realize over time that many of the supplies and actions you need to keep going in the face of disaster are the same regardless of actual situation you encounter. To save you the time of coming to this conclusion on your own, below I list the aspects of survival that should be your predominate focus. If you take care of these, you will be in great shape to carry on when the world around you has fallen apart. Disclaimer: There are always exceptions and additions to any list. Your personal situation, state of health and personal needs will dictate exactly what equipment, supplies and knowledge you will need. The list below is meant to be a general list of areas to focus on and is not to be considered all inclusive or mutually exclusive. First Aid - After any disaster or accident, the first thing you need to be able to do is treat any injuries suffered by yourself or others around you. You need ample first aid supplies at home, in the car and at work. Shelter - aka on going personal protection from the weather, sun, insects, dust, wind etc. You need to be able to stay warm and dry if you plan on surviving. Remember to take into account, the climate in your area. Shelter means different things in July and January for many people. No Water - You need to consume at least 2.5 liters (minimum) everyday just for your body to be able to function. You need more to keep yourself clean and to cook. Having no safe water on hand to drink will limit your survival chances and affect your ability to help yourself. Store lots of drinkable water! No Food - Everything you do after a disaster will be more difficult and take longer than it normally would. You will be burning more calories than you would sitting on the couch watching CNN. To preserve your ability to do work and stay healthy, you need to be able to eat. This is why you need to store food. Money - We live in a consumer society. We are used to buying what we need to live. There is no reason to expect that everything you will need to procure after a disaster will be available to you for free. The bank wont be open so you will need to have some money available to purchase "things" from others. Safety and Security - For every 50 people you put together in a group, there will be a few who have no compunction against doing you harm or taking what you have for themselves if given the opportunity. It is not unreasonable to assume that some stressed out desperate people will behave badly. You need to ensure that you have considered how you can protect your person, shelter, water and food from this often over looked threat. Energy Sources/Utilities - It is safe to assume that in any disaster some or all of the public utilities you depend on to power your stove, furnace and lights may not be available for quite a while. You need a means of seeing in dark, cooking your food, safely disposing of human and food wastes. Communication - You need a means of learning what is going on and gathering information on threats that exist that you may not be able to see. You need to know where to go and what to do. You need a radio to listen to messages from authorities. Because you are prepared, you may not need many or any relief supplies, but you need to know where these are being distributed if for no other reason than to avoid the throngs of unruly people who will congregate at these locations. Restricted Travel - It may not be possible for you to travel within your town or between towns depending on the nature of the disaster or restrictions on movement imposed by the authorities. You need options that enable you to stay put under less than optional conditions. You should also consider providing yourself the option of leaving an area of perceived adversity if you have some advanced warning of events to come. Advanced medicine or life support - Hospitals, medical clinics and doctors/nurses in general may well be overwhelmed by the needs of the many in the aftermath of a disaster. While no one can be expected to perform surgery on their loved ones, having the skills and supplies to suture open wounds, antibiotics for infections and rudimentary dental work is a great advantage. The next time you get your teeth cleaned, ask your dentist for the tools and compounds to apply temporary fillings and to treat cuts in the mouth and tongue. Lost Records - You may need to prove who you are, that you own the land you are living on, that you have insurance in one form or other, that you are licensed to possess that rifle etc. You need to have copies of important paperwork in the event that the originals are no longer available. Mental Health & Spirituality - Time will pass slowly without all of the modern distractions we have come to rely on (TV, computers, etc). Plan for those times when there isn't much to do. Keep yourself amused and the kids entertained. Playing cards, simple board games for the boring times (usually when it is dark but too early to go to bed). A Bible or equivalent scripture may be comforting to some. When beginning the process of getting yourself and your family prepared for tough times, if you concentrate on the above areas of focus you can quickly and effectively increase your chances of survival and at the same time become independent of the need to rely on others in the short and long term. It is important that you begin to prepare right away. This post is an attempt to make it easier for you to begin this process. Please, do not procrastinate and assume that others will be willing or able to help you out. Your life is your responsibility. There are some common personality traits that most survivors have in common. The following is a list of the 4 most common traits of people who have survived extraordinary situations. 1. Survivors stay Calm in the face of Danger. A survivalist has the ability to stay calm in the face of whatever life may throw at him. It’s not that the survivor is without fear, instead he has the courage to face his fears. To be able to stay calm in the face of danger requires preparation & training. The more information you have the easier it is to stay calm during any survival situation. Survivors can find a use for everything around them. They know how to pick gear with multiple purposes, and they know how to improvise when they find themselves without the needed tools or gear. Survivors have the ability to make fire without matches, find water where there are no faucets, and find food where there are no stores. They are the ultimate tinkerers. In day to day life, the survivalist will find away to fix something that’s broken, before running off to Walmart to buy a new one. These skills are indispensable in an emergency situation. They know how to make the tough decisions that will keep the people around them alive. During an emergency situation, while most are panicking and making stupid mistakes, a survivalist will stop, access the situation and then take action. They are the ultimate leaders! How to have a home with no house payments and no monthly utility bills! This is an introduction to simple solar homesteading that provides information on how to find cheap land, build an inexpensive home, and use solar power to eliminate monthly utility bills. What would you do if you had no house payment and no monthly utility bills ? Just a couple of ways of many many ways on how to snare a rabbit!